The University of Cambridge’s Centre for the Study of Existential Risk have had a mod made for Civilization V that explores the possibility of an AI-induced apocalypse. Also, Cambridge has a Centre for the Study of Existential Risk. I’m not sure if it’s encouraging that clever people are working on this, or discouraging that they feel it necessary to do so. Plan for global annihilation in the best strategy games on PC. The mod is called Superintelligence, and it adds a number of new techs concerning the development of artificial intelligence. 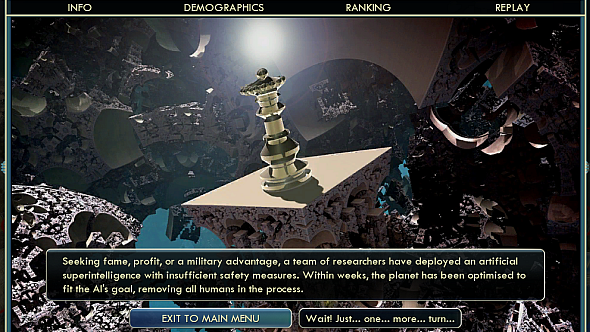 These have several outcomes: either you or a rival player controls AI and achieves what looks like a modified Science victory, or too much uncontrolled research unleashes a rogue superintelligence that destroys humanity. New techs include Deep Blue, Machine Learning, and the Orthogonality Thesis, which states that AIs can have any combination of intelligence and goal, in contrast to the view that they will converge to a single common goal because of their intelligence. You can grab the Superintelligence mod on Steam here.